Hypertrophic cardiomyopathy (HCM) with mid-ventricular cavity obstruction and apical aneurysm formation is a rare phenomenon. It is associated with worse outcomes due to increased incidence of ventricular tachycardia, thrombus formation and stroke apart from other traditional HCM complications such as outflow tract obstruction and heart failure. It can occasionally be missed on traditional echocardiography and better delineated by cardiac catheterization on left ventriculogram. We present a case of HCM with mid-ventricular obstruction and apical aneurysm formation who presented with stroke with hospital course complicated by ventricular tachycardia requiring an implantable cardioverter defibrillator. Hypertrophic cardiomyopathy (HCM) is a myocardial disorder caused by mutations of the sarcomere or its associated proteins . Histologically, HCM shows hypertrophied myocytes in a chaotic, disorganized fashion with interstitial fibrosis. When the myocardium hypertrophies to a significant degree, intraventricular cavity obstruction may occur. Depending on the site and degree of obstruction, patients may have myocardial ischemia, diastolic dysfunction, mitral regurgitation, and left ventricular (LV) outflow obstruction which can cause heart failure, chest pain, arrhythmias, syncope, or death. There are different phenotypic variants of asymmetric hypertrophy with the midventricular variant being amongst the rarest, with incidence about 1% . The occurrence of mid cavitary obstruction with apical aneurysm formation is a rare phenomenon. We describe a 41-year-old female with a medical history of obesity, hypertension, and intermittent palpitations. She presented to our facility with right-hand grip weakness and facial drooping of the left side of one-minute duration. Magnetic resonance imaging (MRI) of the brain showed a small late acute ischemic infarct in the left insular region. EKG showed atrial fibrillation with rapid ventricular response and T wave inversions in the anterolateral leads (Figure 1). Cardiology was consulted for evaluation of atrial fibrillation in the setting of stroke, and TEE showed moderately reduced ejection fraction at thirty-five percent with apical hypokinesis and mid-cavity hypertrophy. However, midcavity obstruction was not appreciated in this study. An echogenic density was appreciated in the left atrial appendage with a small inter-atrial shunt on agitated saline study. Cardioversion was not done due to suspicion for thrombus. 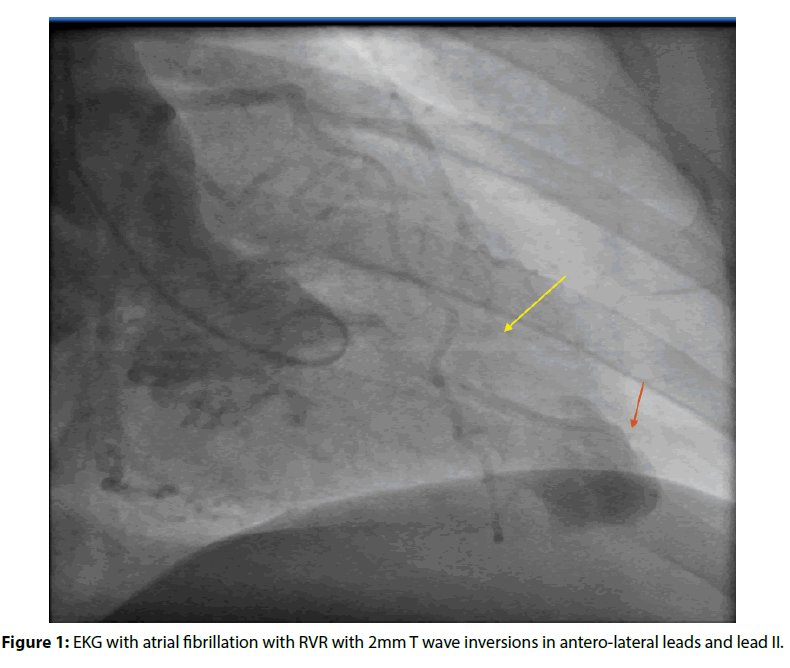 Figure 1: EKG with atrial fibrillation with RVR with 2mm T wave inversions in antero-lateral leads and lead II. 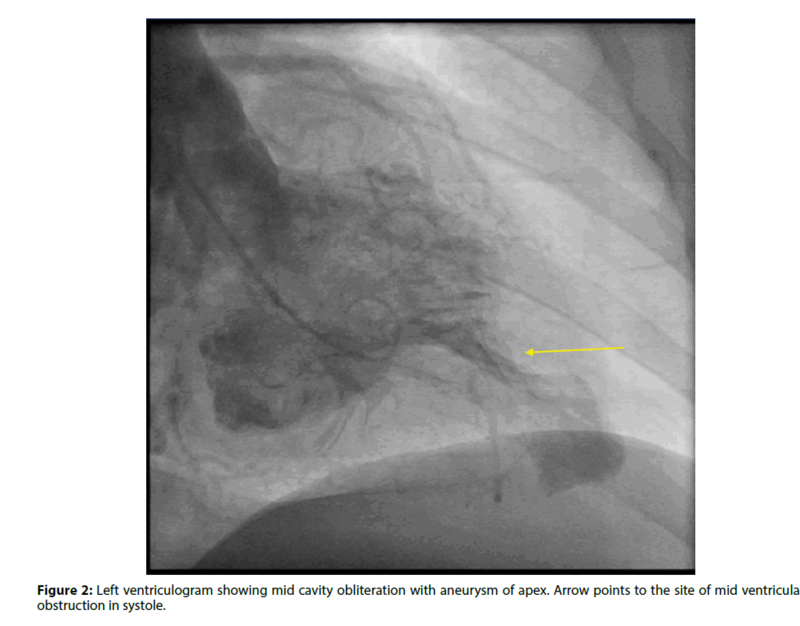 Coronary angiogram showed normal coronaries, and her left ventriculogram showed mid cavitary obliteration in systole with aneurysm of the apex (Figures 2 and 3). A cardiac MRI was performed which confirmed the diagnosis of mid-cavity hypertrophic obstructive cardiomyopathy with an apical aneurysm. She was evaluated by cardiothoracic surgery, and the morbidity of the surgery was deemed more than the benefit. She received cardioversion after six weeks of anticoagulation and was maintained on long term anticoagulation following this due to her HOCM. She had episodes of sustained ventricular tachycardia during her hospitalization and received an implantable defibrillator. Figure 2: Left ventriculogram showing mid cavity obliteration with aneurysm of apex. Arrow points to the site of mid ventricular obstruction in systole. Figure 3: Left ventriculogram showing the side of mid cavitary obstruction and aneurysmal apex in systole. Yellow arrow points towards mid cavity obstruction and red arrows towards the anuerysmal apex. HCM is a relatively common condition (1 in 500) and is the most common cause of sudden cardiac death among young patients in North America. It is caused by genetic mutations in sarcomere proteins (most commonly β-myosin heavy chain, myosin binding protein C, troponin I, and troponin T) and follows an autosomal dominant pattern of inheritance. There are different phenotypic variants of asymmetric hypertrophy with the septal variant being the most common (90%) and less common forms symmetric 5%, apical 3%, posteroseptal and lateral wall 1% and midventricular 1% . Minami et al. showed in their study that the incidence of apical aneurysm formation in midventricular obstruction (MVO) was 28.3%. While MVO was independently associated with worse outcomes such as sudden cardiac death and arrhythmias (HR: 2.43, p=0.045, the additional presence of an apical aneurysm was associated with worse prognosis (HR: 5.08, p <0.001) . The mechanism of aneurysm formation is interesting. Hypertrophy in the midventricular variant creates two chambers on either side of the obstruction: a highpressure distal chamber and a lower pressure proximal chamber. Prolonged high pressure in the apical chamber causes sub endocardial ischemia and subsequent necrosis which leads to thinning, scarring and aneurysm formation in the apex . Higher pressure in the apical chamber than in the main chamber causes paradoxical jet flow into the proximal chamber during diastole. This finding on Doppler echocardiography has been shown to be associated with apical aneurysm formation, more thallium perfusion abnormalities localized to the apex, ventricular tachycardia (VT) and, more systemic embolism . While this finding can be missed on routine echocardiography, it has been shown that it is almost always detected by ventriculogram, as was the case with our patient . Moreover, the presence of apical wall motion abnormality, following an anterior or inferior infarction, compared to its absence has proven to be associated with high risk for Left Ventricular (LV) thrombus formation even in patients without HOCM . The initial recommended strategy for the management of symptomatic hypertrophic obstructive cardiomyopathy (HOCM) patients is pharmacotherapy with beta blockers or calcium channel blockers . While there is robust evidence and guidelines for surgical options such as septal myomectomy and alcohol ablation for the management of left ventricular outflow tract (LVOT) obstruction not relieved by medications, these treatment modalities have not been standardized for treatment of MVO, though they can be offered . There are some reports of successful trans aortic septal myomectomy performed in these patients. However, the surgery is more challenging, encompasses more extensive myomectomy and requires alterations to the conventional surgical procedure used for LVOT obstruction [7,8]. For patients with formidable surgical risk and LVOT, guidelines have suggested that alcohol septal ablation may be considered (class IIb indication), but has been discouraged in even in patients with LVOT obstruction with septal thickness >20 mm due to uncertain benefit . While alcohol septal ablation has been attempted in a limited number of cases [8,9], it remains controversial due to the possibility of added damage and scar formation in an akinetic apex, from the ablation . In our patient, due to her comorbidities, she was deemed to be at high surgical risk, and medical management was elected. She received an ICD for secondary prevention of symptomatic sustained VT, following AHA/ACC guidelines. Due to the rarity of MVO with an apical aneurysm, development of standardized treatment guidelines remains an uphill task. Although, HCM is a relatively common condition, mid ventricular cavity obstruction is rare and should be assessed for apical aneurysm formation as these patients are at higher risk for morbidity and mortality. Ananthasubramaniam K. Hypertrophic cardiomyopathy. In: Crawford MH. eds. current diagnosis & treatment: cardiology.5e New York, NY: McGraw-Hill (2018). Minami Y, Kajimoto K, Terajima Y, et al. Clinical implications of midventricular obstruction in patients with hypertrophic cardiomyopathy. J Am CollCardiol. 57:2346-55 (2011). Sivanandam A, Ananthasubramaniam K. Midventricular Hypertrophic cardiomyopathy with apical aneurysm: potential for underdiagnosis and value of multimodality imaging. Case Rep Cardiol.9: 717-948 (2016). Nakamura T, Matsubara K, Furukawa K, et al. Diastolic paradoxic jet flow in patients with hypertrophic cardiomyopathy: evidence of concealed apical asynergy with cavity obliteration. J Am CollCardiol. 19:516-24 (1992). Asinger RW, Mikell FL, Elsperger J, et al. Incidence of left-ventricular thrombosis after acute transmural myocardial infarction. Serial evaluation by two-dimensional echocardiography. N Engl J Med. 305: 297-302 (1981). Gersh BJ, Maron BJ, Bonow RO, et al. ACCF/AHA guideline for the diagnosis and treatment of hypertrophic cardiomyopathy: executive summary. J Am CollCardiol.58: 2703-38 (2011). Schulte HD, Bircks W, Körfer R, et al. Surgical aspects of typical subaortic and atypical midventricular hypertrophic obstructive cardiomyopathy (HOCM). ThoracCardiovasc Surg. 29: 375-80 (1981). Cecchi F,Olivotto I, Nistri S, et al. Midventricularobstruction and clinical decision-making in obstructive hypertrophic cardiomyopathy. HerzKardiovaskuläreErkrankungen.31: 871-6 (2006). Seggewiss H. Percutaneous septal ablation for hypertrophic cardiomyopathy and mid-ventricular obstruction. Eur J Echocardiogr.1:277-80 (2000). Shah A, Duncan K, Winson G,et al. Severe symptoms in mid and apical hypertrophic cardiomyopathy. Echocardiography.26:922-33 (2009).